Major Sacaton (Sedentary) Phase Hohokam tool traditions and the obsidian source provenance mix for the traditions. Width of arrows denotes approximate proportions of those sources in the traditions (from Shackley 2005). Illustration by Shearon Vaughn. This decades long research into the complexity of obsidian source provenance in the Southwest, have allowed us to address many of the 21st century issues that have come to fore, such as the understanding social networks, migration, and social identity. The latter issue is at the center of the technological and geochemical research in Preclassic Hohokam identity, territory, and possible kin relationships. Some of this work has been done in concert or parallel with Dave Abbot’s research on Hohokam ceramics looking at identity, production, and kin networks as well. 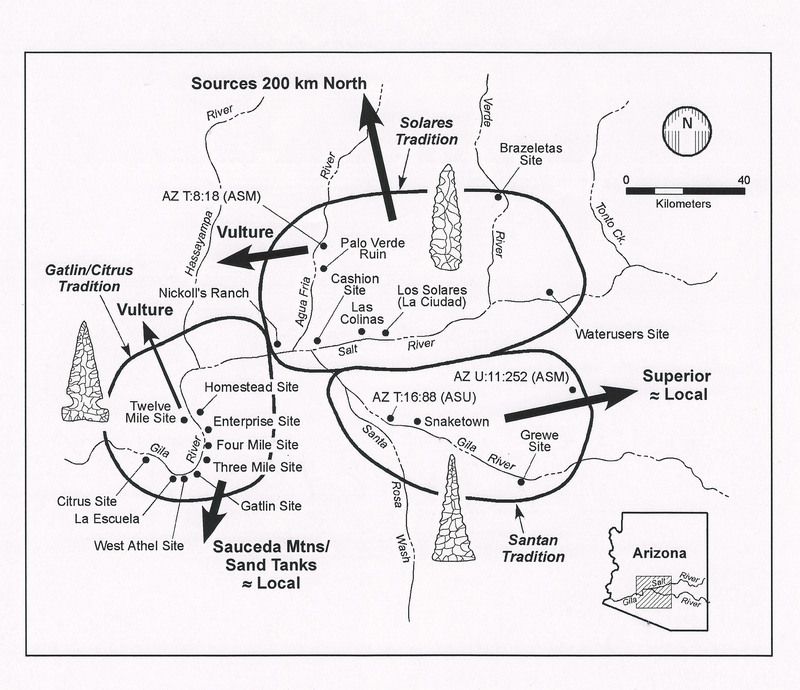 While the inferences derived from these studies are thankfully open to interpretation, using provenance of the obsidian used to make many of these Sedentary period projectile points, suggests that attempts were made by the toolmakers to imbue a style that appears to be restricted to one of three areas of the Sedentary Hohokam core area, and more to the point, the raw material was procured from very different sources including sources outside the Hohokam sphere. Following Abbot’s and others work, a model is presented here of male social identity that signals attempts to identify themselves as members of sub-regions, and that this self-identity could be aligned with canal irrigation and ballgame groups, or warrior sodalities like those of the Lower Colorado River Quechan and Mohave.